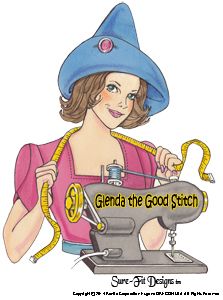 Sew along with Glenda the Good Stitch and her Holiday Happy Top. This interesting bodice design features dolman sleeves, angel wings to finish them off, and a unique design that hides the bust fitting dart in the horizontal seam that sews two complimentary fabrics together. 7 lessons - view as many times as you want. Since 1982, Glenda has been President of Sure-Fit Designs™, an international company specializing in pattern fitting and designing. Canadian born, her impressive background includes 10 years as a Home Economics educator, plus 36 years in the sewing industry. Based in Eugene, OR, she has traveled extensively in the USA, Canada, Australia, N.Z., and Great Britain showing home seamstresses the ease of achieving excellent pattern fit with the Sure-Fit Designs™ system of pattern fitting and designing. 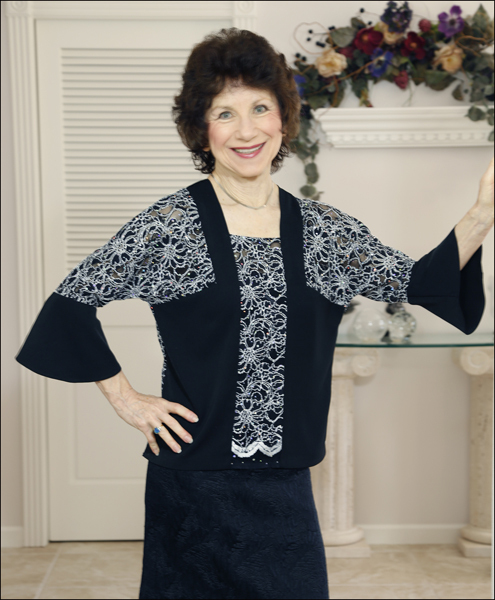 She has authored numerous articles, pattern fitting, designing, fabric embellishment and machine embroidery books for the benefit of home seamstresses worldwide. She has been featured in sewing forums and shows throughout the USA and Australia and is recognized as a leading educator in the sewing industry. For additional assistance if required contact Glenda at info@surefitdesigns.com. Excellent. Glenda makes the hardest of instructions so SIMPLE -- even a child could follow along. That's what I love about Glenda.